Mutabar Tadjibayeva, one of Uzbekistan’s best known human rights defenders and Laureate of the Martin Ennals Award 2008, has filed a complaint against Uzbekistan for her brutal torture and forced sterilisation when she was serving an eight-year prison sentence for her human rights activities. The international human rights organisations FIDH and REDRESS recently filed the complaint on her behalf before the UN Human Rights Committee. This is the first known case before the Committee involving a Uzbek human rights defender being forcibly sterilised. 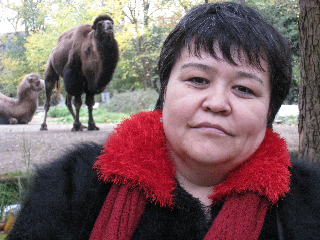 Tadijbayeva has repeatedly sought an investigation from Uzbek authorities into the serious human rights violations that she has suffered since 2002, but her claims have never been investigated and no-one has ever been prosecuted for them. Tadjibayeva is asking the Committee to order Uzbekistan to conduct an effective investigation, punish those found responsible and provide her with reparation, including compensation, as well as her full medical records about the surgery that left her infertile, among other things. “The authorities have transformed my life into a nightmare, they didn’t succeed in silencing me – this is the only flaw in their campaign to break my body and my soul. They have succeeded, though, in making me feel not a woman anymore, not a woman like before,” said Tadjibayeva.Tadjibayeva, 50, had been denouncing human rights violations in eastern Uzbekistan for several years and had forcibly condemned the shooting and killing of hundreds of unarmed civilians by government forces in the city of Andijan in May 2005. She also founded and headed the human rights organisation Fiery Hearts Club in eastern Uzbekistan; it now runs from Paris, where she has been living as a refugee since 2009.In 2005, five months after the Andijan massacre, she was arrested by masked and armed security forces who rushed into her home, as she was preparing to travel to Ireland for a human rights conference. She was charged on 18 counts of criminal activity, including tax fraud and membership of an illegal organisation – her own human rights group. In 2006, she was sentenced to eight years in prison following a trial that violated fair standards. She was denied the right to prepare a proper defence or cross-examine key prosecution witnesses. Her conviction was upheld on appeal.After her sentencing, Tadjibayeva spent almost two years and eight months in prison, where she suffered severe torture and ill-treatment, including being beaten, hung from a hook, forced to stand naked in the cold until she fell unconscious, and encouraged by prison guards to commit suicide. She was also forced to undergo an operation to remove her uterus. Up to this day, she has not been able to see her full medical records or know the reason for her operation. Tadjibayeva also endured torture and ill-treatment in the years prior to her imprisonment. In April 2005, she was kidnapped by several law enforcement officials and taken to the Department of Internal Affairs, where was interrogated about her human rights activities, beaten and gang-raped by several men.In May 2008 it was announced that she would receive the Martin Ennals Award for Human Rights Defenders while the Fiery Hearts Club she founded was awarded the Medaille de la République Française. She was freed in June 2008, after intensive efforts by diplomats and human rights organisations. “Human rights defender Mutabar Tadjibayeva shared the fate of hundreds of Uzbek citizens who are being tortured and ill-treated in prisons in Uzbekistan. Because of her human rights activities, she spent two and a half years behind bars, was raped and forcibly operated on while in detention. Despite all this, she continues to fight for justice and dignity,” said FIDH President Souhayr Belhassen. This entry was posted on	February 28, 2013 at 11:41	and is filed under human rights.